Business investment in “big data analytics” (or “big data”) continues growing. Some of this growth is a bet that big data will not only improve operations, but reveal hidden paths to new breakthrough growth strategies. This bet rests partly on the tech giants’ famous use of big data. We have recently seen the emergence, in part also using big data, of major new consumer businesses, e.g., Uber and Airbnb––discussed in this second post of our data-and-growth-strategy series. Again using big data, some promising growth-strategies have also emerged recently in old industrials, including GE and Caterpillar (discussed in our next post). Many thus see big data as a road map to major new growth. 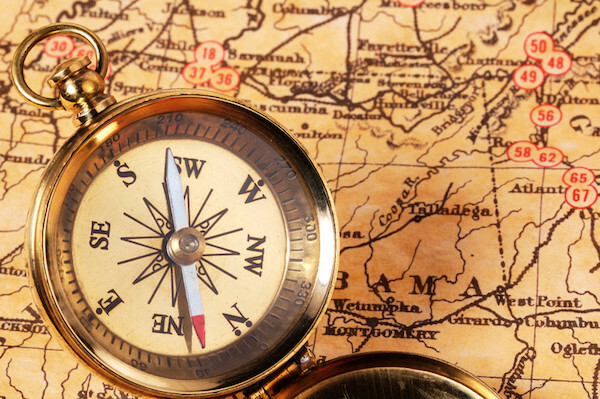 Like a compass, big data only helps once you have a map––a growth-strategy. To discover one, first “become the customer”: explore and analyze their experiences; then creatively imagine a superior scenario of experiences, with positives (benefits), costs, and any tradeoffs, that in total can generate major growth. Thus, formulate a “breakthrough value proposition.” Finally, design how to profitably deliver (provide and communicate) it. Data helps execute, not discover, new growth strategies. 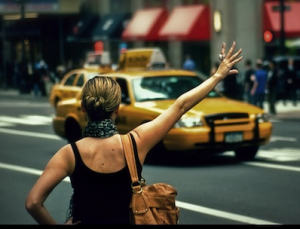 Did Uber and Airbnb use data to discover, not just execute, their strategies? Let’s see how these discoveries were made. Garrett Camp and Travis Kalanick co-founded Uber. Its website claims that, in Paris in late 2008, the two “…had trouble hailing a cab. So, they came up with a simple idea—tap a button, get a ride.” Kalanick later made real contributions to Uber, but the original idea was Garrett Camp’s, as confirmed by Travis’ 2010 blog, and his statement at an early event (quoted by Business Insider) that “Garrett is the guy who invented” the app. However, the concept did not just pop into Camp’s mind one evening. As described below, the idea’s genesis was in his and friends’ frustrating experiences using taxis. He thought deeply about these, experimented with alternatives, and imagined ideal scenarios––essentially the strategy-discovery methodology mentioned above, and that which we call, “become the customer.” He then recognized, from his own tech background, the seeds of a brilliant solution. Camp was technically accomplished. He had researched collaborative systems, evolutionary algorithms and information retrieval while earning a Master’s in Software Engineering. By 2008 he was a successful, wealthy entrepreneur, having sold his business, StumbleUpon, for $75M. This “discovery engine” finds and recommends relevant web content for users, using sophisticated algorithms and big data technologies. Why are taxis dirty and uncomfortable and never there when you need them? Why is it that half the time, they don’t show up for those 6 a.m. airport runs? How come they all seem to disappear when you most need them—on New Year’s Eve, or during a rainy rush hour? Women complain about scary drivers. Black men complain about drivers who won’t stop to pick them up. The maddening experience of not enough taxis at peak times reflected the industry’s strong protection. For decades, regulation limited taxi licenses (“medallions”), constraining competition, and protecting revenue and medallion value. The public complained, but cities’ attempts to increase medallions always met militant resistance; drivers would typically protest at city hall. And if you didn’t like your driver or car, you could leave no tip or complain, but not with any real impact. Irritated, Camp restlessly searched for ways around these limits. As hailing cabs on the street was unreliable, he tried calling, but that was also problematic. Dispatchers would promise a taxi “In 10 minutes” but it often wouldn’t show; he’d call again but they might lie or not remember him. Next, he started calling and reserving them all, taking the first to arrive, but this stopped working once they blacklisted Camp’s mobile phone. He then experimented with town-cars (or “black cars”). These were reliable, clean and comfortable, with somewhat more civil drivers, though more expensive. However, as he told Stone, their biggest problem exacerbating their cost was filling dead-time between rides, which to a lesser degree also affected regular taxis. As McArdle wrote, “Drivers turn down [some long-distant fares since] they probably won’t get a return fare, and must instead burn time and gas while the meter’s off” which can wipe out the day’s profit. Camp could now imagine much better ride-hailing experiences, but how to implement this vision? Could technology somehow balance supply and demand, and improve the whole experience for riders and drivers? At that moment (as he later told Stone) Camp recalled a futuristic James Bond scene he loved and often re-watched, from the 2006 Casino Royale. 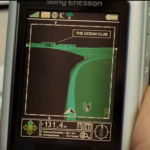 While driving, Agent 007’s phone shows an icon of his car, on a map, approaching The Ocean Club, his destination. Camp immediately recognized that such a capability could bring his ride-hailing vision to life. When iPhone was launched in 2007 it not only included Google Maps, but Camp knew it also had an “accelerometer” which let users know if their car was moving. Thus, the phone could function like a taxi meter, charging for time and distance. And in Summer of 2008, Apple had also just introduced the app store. Camp knew this meant he could invent a “ride-hailing app” that would deliver benefits––positive experiences. With it, riders and drivers would digitally book a ride, track and see estimated arrival, optimize routes, make payments, and even rate each other. The app would also use driver and rider data to match supply and demand. This match would be refined by dynamic (“surge”) pricing, adjusting in real time as demand fluctuates. Peak demand would be a “tradeoff”: higher price but, finally, reliable supply of rides. With these adjustments, Uber’s strategy was fully developed. Camp and later Kalanick had “become the customer,” exploring and reinventing Uber’s “value propositions” ––the ride-hailing experiences, including benefits, costs and tradeoffs, that Uber would deliver to riders and drivers. These value propositions were emerging as radically different from and clearly superior to the status quo. It was time to execute, which required big data, first to enable the app’s functionalities. Kalanick also saw that Uber must expand rapidly, to beat imitators into new markets; analytics helped identify the characteristics of likely drivers and riders, and cities where Uber success was likely. Uber became a “big data company,” with analytics central to its operations. It is still not profitable today, and faces regulatory threats; so, its future success may increasingly depend on innovations enabled by data. Nonetheless, for today at least, Uber is valued at $69B. Yet, to emulate Uber’s success, remember that its winning strategy was discovered not by big data, but by becoming its users. 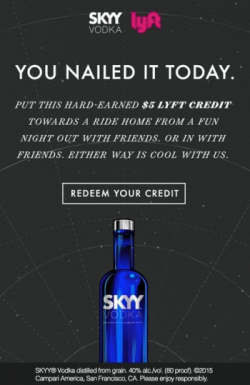 Uber studied and creatively reinvented key experiences––thus, a radically new value proposition––and designed an optimal way to deliver them. Now let’s turn to our second, major new consumer business, frequently attributed to big data. Airbnb’s launch was relatively whimsical and sudden. It was not the result of frustration with an existing industry, as with ride-hailing. Rather, the founders stumbled onto a new concept that was interesting, and appealing to them, but not yet ready to fly. Their limited early success may have helped them stay open to evolving their strategy. They embarked on an extended journey to “become” their users, both hosts and guests; they would explore, deeply rethink, and reinvent Airbnb’s key customer-experiences and its value proposition. Big data would become important to Airbnb’s execution, but the evolutionary discovery of its strategy was driven by capturing deep insight into customer experiences. Providing and communicating its value proposition, Airbnb outpaced imitators and other competitors, and is valued today at over $30B. Like Uber, Airbnb is a great example of the approach and concepts we call “value delivery,” as discussed and defined in our overview, Developing Long-Term Growth Strategy. In 2007, Joe Gebbia and Brian Cheskey, both twenty-seven and friends from Design school, shared a San Francisco apartment. They hoped for entrepreneurial opportunities, but needed cash when their rent suddenly increased. A four-day design conference was coming to town, and most hotels were booked. Gebbia suggested “turning our place into ‘designers bed and breakfast’–offering…place to crash…wireless internet…sleeping mat, and breakfast. Ha!” Next day, they threw together a web site, airbedandbreakfast.com. Surprisingly, they got three takers; all left happy, paying $80 per night (covering the rent). They all also felt rewarded by getting to hear each other’s stories; the guests even offered advice on the new business. Cheskey and Gebbia gave each other a look of, “Hmmm…” and a new business had been born. We thought, surely you would never stay in a home because you wanted to…only because it was cheaper. But that was such a wrong assumption. People love homes. That’s why they live in them. If we wanted to live in hotels, more homes would be designed like hotels. …was pretty unusual and I actually attribute a lot of our success to that combination. We see things differently. Sometimes it takes a while to reconcile those different perspectives but we find when we take the time to do that we can come up with a superior solution, one that takes into account both points of view. In August of 2008, the team thought they had made a breakthrough. Obama would accept the Democratic nomination before 100,000 people in Denver, which only had 30,000 hotel rooms. So, Airbnb timed its second launch for the convention. Sure enough, they saw a huge booking spike…but it promptly dropped back to near-zero, days later. Searching for a promotional gift for hosts, they pulled off a scrappy, startup stunt. 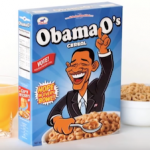 They designed and hand-assembled 500 boxes of cereal, with covers they convinced a printer to supply for a share of sales: Obama Os (“Hope in every bowl”) and Cap’n McCain’s (“Maverick in each bite”). CNN ran a story on it, helping sell some at $40 per box, for over $30K total––enough to survive a few more months. But mid-2009, they were still stalled, and about to give up. About fifteen investors all ignored Airbnb, or saw nothing in it. Then Paul Graham, a founder of “Y Combinator” (YC, a highly-regarded, exclusive start-up-accelerator), granted Airbnb his standard five-minute interview, which he spent telling them to find a better idea (“Does anyone actually stay in one of these? …What’s wrong with them?”) But on the way out the door, thinking all was lost anyway, Chesky handed a box of Obama Os to Graham, who asked, “What’s this?” When told, Graham loved this story of scrappy, resourceful unwillingness to die. If they could sell this cereal, maybe they can get people to rent their homes to strangers, too. We noticed a pattern…similarity between all these 40 listings…the photos sucked…People were using their camera phones [of poor quality in 2009] or…their images from classified sites. It actually wasn’t a surprise that people weren’t booking rooms because you couldn’t even really see what it is that you were paying for. Paul urged them to go to New York immediately, spend lots of time with the hosts, and upgrade all the amateur photography. They hesitated, fearing pro photography was too costly to “scale” (i.e., to use large-scale). Paul told them to ignore that (“do things that don’t scale”). They took that as license to simply discover what a great experience would be for hosts, and only worry later about scale economics. A week later, results of the test came in, showing far better response, doubling total weekly revenue to $400. They got it. 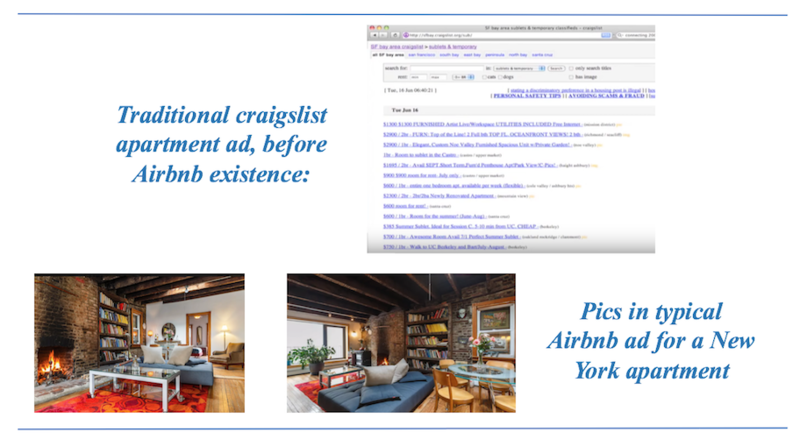 Of course, hi-res photography is common on websites today, even craigslist, and seems obvious now, as perhaps it is to think carefully about wording and pricing in listings. However, these changes made a crucial difference in delivering Airbnb’s value proposition, especially in helping hosts romance and successfully rent their home. This time-consuming effort greatly increased success for these hosts. After that, “people all over the world started booking these places in NY.” The word spread; they had set a high standard, and many other hosts successfully emulated this model. To even more deeply understand user experiences, the team used “becoming the customer,” or what Gebbia calls, “being the patient,” shaped by his design-thinking background. [As students, when] working on a medical device we would go out [and] talk with…users of that product, doctors, nurses, patients and then we would have that epiphany moment where we would lay down in the bed in the hospital. We’d have the device applied to us…[we’d] sit there and feel exactly what it felt like to be the patient…that moment where you start to go aha, that’s really uncomfortable. There’s probably a better way to do this. …a very personalized welcome letter…a Metro Card for me, and [menus from] Katherine’s favorite take-out places…I just felt instantly like, ‘I live here!’ [And on the street] felt like I have an apartment here, I’m like a New Yorker! So, it’s this social connection…to the person and their spaces; it’s about real places and real people in Airbnb. This is what we never anticipated but this has been the special sauce behind Airbnb. To further build trust, users were required to “verify, meaning share their email…online and offline identify.” Hosts were asked “to include large photos of themselves on their profiles.” Hosts and guests were urged to communicate before each stay. It was much broader: It meant venturing into neighborhoods that you might not otherwise be able to see, staying in places you wouldn’t normally be able to, bunking in someone else’s space, [experience] “hosted” for you, regardless of whether you ever laid eyes on him or her. “Belonging” may have been a little warm and fuzzy, or even hokey, but Gallagher cites evidence that the idea seemed to resonate with many users. In late 2012, wanting to build further on this notion and having read an article in Cornell Hospitality Quarterly, Cheskey began thinking that Airbnb should focus more on “hospitality.” He read a book by Chip Conley, founder of a successful boutique-hotel chain. Conley wanted guests to check out, after three days, as a “better version of themselves”; he talked of democratizing hospitality, which had become “corporatized.” Airbnb hired him. Before accepting guests, try to make sure their idea for their trip matches your “hosting style”; [e.g., if they want] a hands-on host and you’re private, it may not be the best match. Communicate often; provide detailed directions. Establish any “house rules” clearly. …beyond basics? [placing] fresh flowers or providing a treat upon check-in, like a glass of wine or a welcome basket. Do these things…even if you’re not present during the stay. Airbnb took longer than Uber to discover their strategy, but they got there, again by climbing into the skin of users, “becoming the customer” (or “being” the patient”), living their users’ experiences. Like Uber, they then used big data extensively, to help execute. For example, building on the early New York experiments to help hosts set optimal prices, Airbnb used big data to create, as Forbes wrote, “Pricing Tips.” This “constantly updating guide tells hosts, for each day of the year, how likely it is for them to get a booking at the price they’ve currently chosen.” Airbnb’s machine-learning package further helps hosts quantitatively understand factors affecting pricing in their market. In combination with the above initiatives to strengthen trust, personal connection, and even that sense of “belonging anywhere,” big data helped Airbnb continue to improve the value proposition it delivered. Its great strategic insights into user experiences, and its superb execution, allowed Airbnb to outdistance its imitative competitors. So, both Uber and Airbnb made great use of big data. Yet, for both these game-changing businesses, to “become the customer” (or “being the patient”) was key to discovering the insights underlying their brilliant, breakthrough-growth strategies. Who Needs Value Propositions When We Have Big Data? In the past decade, “big data analytics” (or “big data”) has grown dramatically in business. Big data can help develop and execute strategy—as in Google and Facebook’s ad businesses, and Amazon and Netflix’s recommendation engines. Seeing these huge tech successes, many decided to just emulate how big data is used, hoping that big data analytics alone can drive development of long-term growth strategy. This belief is a delusion. Winning strategies require that businesses discover new or improved experiences that could be most valued (though unarticulated) by customers, and redesign their businesses to profitably deliver these experiences. Big data can increase communication efficiency and short-term sales, or “clicks”, but changing the most crucial customer experiences can transform behaviors, attitudes, and loyalty, leading to major growth. Such insight is best found in many businesses by in-depth exploration and analysis of individual customers—and cannot be found in the correlations of big data. Some questions are easiest answered with big data, but availability of data should not drive what questions to ask. Data-driven priorities can obscure fundamental strategic questions, e.g. what could customers gain by doing business with us—what value proposition should we deliver, and how? Discovering such insights requires deeply understanding customers’ usage of relevant products or services. In some businesses, such as online retailers, customers’ buying-experiences constitute usage of the service, so these businesses do have usage data, and can use big data in developing strategy. For most, such as product producers, however, usage happens only after purchase, so they have purchase but not usage data, and cannot properly use big data to develop strategy. Feeling compelled to use big data, such businesses may use it anyway, on the data they have, which can help achieve short-term sales, but not to develop long-term growth strategy. However, these businesses still can— and must—develop insights into what usage experiences to focus on changing, and how. Digital marketing now plays a major role in developing business strategy, and heavily uses big data. Big data predictive algorithms analyze customers’ past transactions and purchase or shopping behaviors, to increase the efficiency of matching customers with marketing offers, and strengthen short-term sales. Sustained major growth requires more than ratcheting reach-efficiency and tweaking the week-end promotional tally. Sustained growth requires creative exploration of customers’ current experiences, to discover breakthrough value propositions, and design ways to profitably provide and communicate them. This post and follow-ups discuss these concerns and suggest solutions. As illustration, a Customer Experience Management (CEM) system by Sitecore helps fictional apparel maker “Azure” (Sitecore’s name) use big data to customize marketing to individual customers. Here, Azure intervenes with consumer “Kim” on her decision journey. When she visits their site anonymously, the data shows her matching their active-mother profile. Clicking on a shoes ad, she signs up for email alerts, providing her name and email. Azure begins building her profile. They email a belts promotion to customers predicted by the data as potentially interested—Kim buys one. Later, real-time location data shows Kim near an Azure store, so CEM texts an in-store discount on a new boots line; Azure is confident she’ll like it based on her past actions. Scanning the coupon on Kim’s phone, the CEM enables the clerk to offer Kim another product, a child’s backpack, based on Kim’s profile. Kim is impressed—Azure understands her interests, tracking her every action. She joins Azure’s loyalty program, giving her sneak peeks at coming products. With data showing that Kim most often accesses the site by smart phone, Azure offers her their new mobile app. Via big data, Azure has improved the shopping and buying experiences, and efficiently stimulated short-term sales. In applications of big data for marketing and growth-strategy, data scientists search for previously unknown correlations among customer transactional and behavioral data. For growth strategy, however, more understanding and creative thought is needed about why customers do what they do, what the consequential experiences have been, what is imperfect in these experiences, and how the business might cause these new or different experiences. 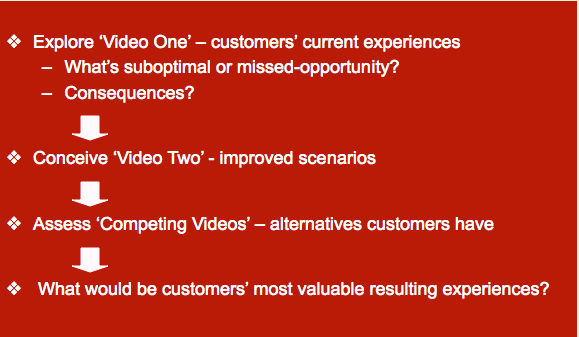 These are typically unarticulated opportunities for improved customer experiences. Identifying them requires skilled observation and creative interpretation of current experiences—not replicable in most businesses by data collection and analytics. Such analysis, including customers’ product-usage behaviors, not just purchase, is crucial to developing value propositions that can generate major new growth. Urging us to “Use big data to create value for customers, not just target them,” Niraj Dawar said in HBR that big data holds out big promises for marketers, including answers to “who buys what, when?” Marketers “trained their big data telescopes at a single point: predicting each customer’s next transaction,” in detailed portraits of consumers’ media preferences, shopping habits, and interests, revealing her next move. In the Azure narrative, Azure is “pretty confident” of what Kim will want, where and when, based on understanding her interests and interactions. In addition to targeting, big data allows “personalizing”—using our knowledge and references to customers’ past purchases and interests, to make our marketing more relevant and thus more effective in winning that next short-term promotional sale. This saga, of Kim’s “well-guided shopping journey” with Azure, leaves Kim happy (though not entirely of her own free will). In this way, it is reminiscent of Minority Report’s mall scene. The novel and 2002 film focused on prediction (“precognition”) of crimes not yet committed (supernaturally foreseen by “PreCogs”). We can hope this premonition is only a dystopic nightmare, but marketers may find the film’s futuristic marketing a utopian dream. The marketing is precisely targeted and highly personalized—ads and holographic greeter automatically recognize and call out the character’s name, reminding him of a recent purchase. Fifteen years ago, the sci-fi film’s marketing technology was showing us the future—ever increasingly accurate predictions of each customer’s next purchase. Big data is thus a kind of commercial precognition. Data scientists are PreCogs using big data, not supernatural powers. Both narratives are fictional, but illustrate the big data logic for marketing and growth-strategy. Able to predict the customer’s next transaction, the CEM produces targeted marketing, more efficient in customer-reach. Personalized marketing is more relevant, helping it stimulate short-term sales. A fundamental problem with this paradigm is that growth strategy needs more than accurate predictions of transactions. Such strategy must transform behaviors, attitudes and loyalty of customers and other players in the chain, based on insights about the causality underlying correlations. Marketers are right to have yearned for much more factual data on what customers do, i.e. their behaviors. However, with big data it has been easy and commonplace to overemphasize customers’ behavior, especially as related to their buying process, without adequately understanding and analyzing the rest of their relevant experience. Businesses must understand customers’ usage experience, not just buying. They must also explore what’s imperfect about this experience, how it could be improved for the customer, what value proposition the business should deliver to them, and how. Such exploration must discover the most powerful, unarticulated customer-opportunities for greater value delivery, and redesign the business to profitably realize such opportunities. These traits are essential to how strategy is different from prediction—strategy must focus on what we want to make happen and how, not just what we might bet will happen. Kim’s past transactional behavior is analyzed to predict what she’ll likely want next, but needs to be pushed further, to discover experiences and value propositions that could influence her, and yield long-term growth. (See a similar complaint about limitations of data, from Clayton Christensen et al.) Actions—including product and service improvements, and intense focus of marketing communications on customer benefits—must then be designed to optimally deliver these value propositions. IDC estimates global revenue for business data analytics will exceed $200B by 2020. As a recent review said, this expansion was enabled by several trends: continued rapid expansion of data, doubling every three years, from online digital platforms, mobile devices, and wireless sensors; huge capacity increases and cost reductions in data storage; and major advances in analytic capabilities including computing power and the evolution of sophisticated algorithms. Previously, “industry poured billions into factories and equipment; now the new leaders invest…in digital platforms, data, and analytical talent.” This investment expands the ability to predict the next short-term transaction, increase marketing-communications efficiency and promotional impact. It also drains resources needed for the more difficult but, as argued here, more strategically crucial exploration of customers’ usage experiences, and discovery of breakthrough-growth value propositions. Using digital technology to market products and services, the digital marketing function has risen rapidly. Last year for the first time, US digital ad-spending surpassed TV, the traditional dominant giant. And digital marketing, both the source of most big data and the easiest place to apply it, increasingly leads development of business strategy. More efficient marketing is desirable, but only if it’s effective, which is often taken for granted in the focus on efficiency. Much digital marketing faith is put in the four-part promise of “the right ad or offer, to the right person, at the right time, via the right place” (see here, and here). Most big data focus on the last three, which mostly enhance efficiency, instead of the “right ad” which determines effectiveness. Hunger for efficiency also drives the focus on targeting. Personalizing, when possible and affordable, can also make customers more willing to hear the message, increasing efficiency—and possibly effectiveness—by its greater relevance. However, effectiveness is the far more crucial issue. If a message does not credibly persuade customers, it is still of little use to the business, even if “efficient.” But targeting and personalizing marketing typically do not identify what behavioral attitudes to change, or how to change them. This more fundamental strategic goal requires deeper understanding of the unarticulated value to customers of improved experiences, and detailed creative exploration of the business’ potential to profitably cause these improvements. Reinforcing the predominant near-term and efficiency focus of big data in digital marketing is the nature of online sources typically available for big data. McKinsey estimated that, “so much data comes from short-term behavior, such as signing up for brand-related news and promotions on a smartphone or buying a product on sale. That short-term effect typically comprises 10 to 20 percent of total sales, while the brand…accounts for the rest.” This short-term nature of the readily available data biases marketers to focus on short-term transactional results. 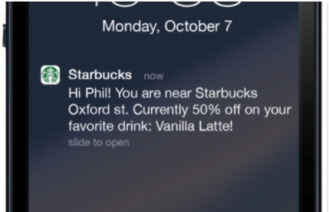 As location data gets more accurate (problematic today) this approach will again improve promotional efficiency. In one illustrative test recounted in Ad Age, Brown-Forman, suppliers of Herradura tequila, teamed with Foursquare (a search-and-discovery mobile app that helps find “perfect places [food, entertainment, etc.]”). Foresquare used Brown-Forman’s list of accounts where Herradura is sold, to target mobile and other Herradura ads to consumers whose mobile was close (or had been in) shops, bars, or restaurants in the account list. They saw 23% increased visits to accounts, a positive signal. Since big data was applied early by direct marketing companies, big data today (further illustrated above by advances in location-based marketing) works more like direct-response marketing than demand-generation. The problem, as noted earlier, is that businesses more than ever also need the latter—demand-generating activity, creating loyalty, thus behavioral changes resulting in long-term growth. Some businesses don’t need these luxuries, when cheap, automated big-data options—digital PreCogs—proliferate. But most businesses do need to make these serious strategic investments, in addition to and complementary with big data analytics. Having digitally captured countless petabytes of data describing Kim’s every action of shopping and buying, the business managers now need to spend time with Kim learning about her usage of that apparel. What were her experiences before and during usage of those shoes, the belt, and other items? And what of her daughter’s experiences with the backpack? What was imperfect, what could some better experiences be, what would be an improved superior value proposition, and what would it take to provide and communicate that proposition effectively and profitably? These intensively customer-focused actions can enable the discovery and activation of powerful insights for profitably influencing customers’ (and others’) behavior, a key basis for generating profitable major growth over time. As mentioned above, this blog series will expand on these concerns about the way that big data analytics has evolved for use in growth strategy, including digital marketing; and will expand on the above recommended solutions for marketers and businesses, including how these solutions apply to most businesses. We suggest that Businesses should be understood and managed as integrated systems, focused single-mindedly on one thing – profitably delivering superior Value Propositions, what we call delivering profitable value (DPV). But most are not. Some readers may assume this discussion can only be a rehash of the obvious – surely everyone ‘knows’ what Value Propositions (VPs) are, and why they matter. But we suggest that most applications of the VP concept actually reflect fundamentally poor understanding of it, and fail to get the most out of it for developing winning strategies. 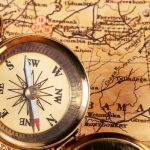 In this post I’ll summarize 4 ways to improve on delivering profitable value, using the VP concept far more effectively – as the customer-focused linchpin to your strategy. Target customers (or other entities) for this VP? Profitable Value? – If customers conclude that a VP is superior to the alternatives, it generates revenues; if the cost of delivering it is less than those revenues, then the business creates profit (or shareholder wealth) – thus, it is delivering profitable value. 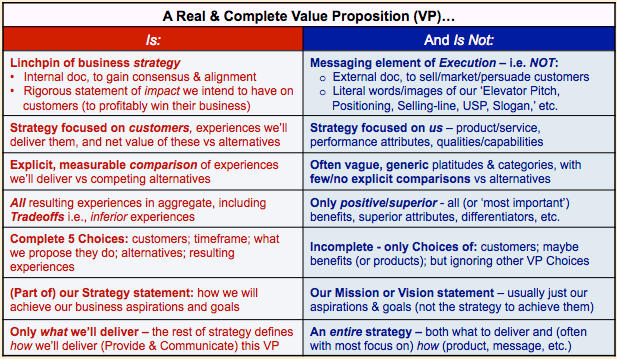 The table below summarizes some common misperceptions about Value Propositions, followed by some discussion of the first two. It’s not your Elevator Speech – a VP is strategy, not execution – For much greater strategic clarity and cross-functional alignment, avoid the common misunderstanding that confuses and equates a VP with messaging. Execution, including messaging is of course important. A VP, as part of your strategy, should obviously drive execution, including messaging; but strategy and execution are not the same thing. If you only articulate a message, without the guiding framework of a strategy, you may get a (partial) execution – the communication element – of some unidentified strategy. But you forgot to develop and articulate the strategy! The execution might still work, but based more on luck than an insightful, fact-based understanding of customers and your market. 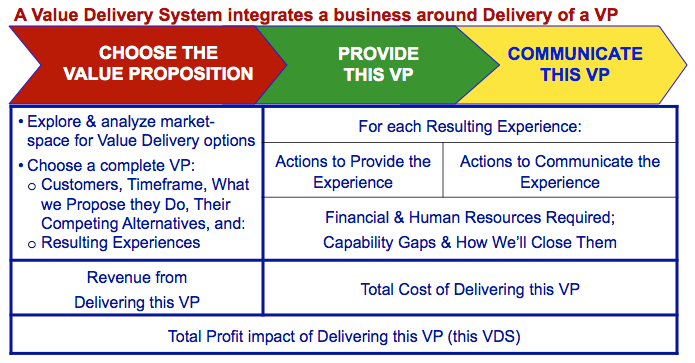 This common reduction in the meaning of a VP, to just messaging, not only confuses execution with strategy, but also only addresses one of the two fundamental elements of execution. That is, a VP must be not only Communicated, but also Provided – made to actually happen, such as via your products/services, etc. If customers buy into your messaging – the communication of your VP – but your business does not actually Provide that VP, customers might notice (at least eventually). Though some businesses actually attempt this approach – promising great things, but not making good – and may even get away with it for a limited time, a sustainable business obviously requires not only promising (Communicating) but actually Providing what’s promised. And it’s not about us – focus VPs on customers, not our products, services, etc. – The other common misuse of the VP concept starts by treating it (rightly) as a strategic decision and internal document. But then (again missing the point) such a so-called VP is focused primarily on us, our internal functions and assets, rather than on the customer and resulting experiences we will deliver to them. Here it’s helpful to recall the aphorism quoted by the great Marketing professor Ted Levitt, that people “don’t want quarter-inch drill bits, they want quarter-inch holes.” A real VP is focused on detailed description of the ‘hole’ – the resulting experiences due to using the drill bit – not on description of the drill bit. Of course, the drill bit is very important to delivering the VP, since the customer must use the drill bit, which must have the optimal features and performance attributes, to get the desired quarter-inch hole. But first, define and characterize the VP, in adequately detailed, measurable terms; then separately determine the drill-bit characteristics that will enable the desired hole. In his recent interview of Michael Lanning (shared in the previous post of this Blog), Brian Carroll asked Mike about the role of Value Props in B2B strategy; Brian wrote about this conversation in the B2B Lead Blog. Recently Michael Lanning was interviewed by Brian Carroll, Executive Director, Revenue Optimization, MECLABS Institute, for the MECLABS MarketingExperiments Blog. Brian asked Mike, as the original creator of the Value Proposition concept in 1983 while a consultant for McKinsey & Company, about the evolution of this concept over the past three decades. Their discussion, on “Real Value Props, Direct from the Source,’ is here. This Blog aims to help illuminate what makes for winning and losing business strategies, discussing what I hope are interesting examples, and suggested explanatory principles that readers in many businesses may find persuasive and actionable. In this Blog I will especially view these topics through the lens we (the DPV Group, LLC ) call ‘Delivering Profitable Value (DPV)’ which contends that strategy should focus single-mindedly on profitable, superior ‘Value Delivery.’ That is, sustainable business success, while elusive and subject to good and ill fortune, can most realistically be achieved by a concentrated, deliberate effort to creatively discover and then profitably Deliver (i.e. Provide and Communicate) one or more superior Value Propositions to customers. While many senior managers would say this idea is ‘obvious,’ we suggest that most do not actually develop or execute their business strategies based on this understanding of the central role of the Value Proposition. Thus in our view, a Value Proposition should not be a slogan or marketing device for positioning products/services, but rather the driving, central choice of strategy, fundamental to success or failure of the business. This Blog will try to bring that idea further to life for a variety of industries and markets. Although unintentionally a rather closely held secret, I actually first created and articulated/coined some of these concepts, including the now widely used (also misused and abused) ‘Value Proposition,’ plus the ‘Value Delivery System’ and the related concept itself of ‘Value Delivery.’ I did so (after my first career, in Brand Management for Procter & Gamble) while a consultant for McKinsey & Company, working closely with Partner Ed Michaels in Atlanta in the early 1980s. Today, the DPV Group and I try to help clients appreciate, internalize and apply these Value Delivery strategy concepts, to pursue profitable, breakthrough growth in a wide range of B2B and B2C businesses. We hope that this Blog will also contribute to that goal.